Are you looking to revamp your home? Certified Painting Professionals can help you with any painting needs that you may have. We are your professional painter in Affton, MO that service both residential and commercial for all painting needs. Rather you are looking to repaint the outside of your home or redecorate the kitchen by adding a new and exciting color to the walls, we are here to service you. We ensure the job is done to your standard and satisfaction as we know our customers are essential to our business growth. All you have to do is give us a call and one of the members of the team will come out and give you an estimate. It is at this time we will go over the exact details of your project. From here, we start the project and upon completion we go through a quality control checklist. This is a checklist that ensure every detail of the project is examined by you to ensure you are 100% satisfied with the job our staff did. Our company ensures that you are pleased through every process and stage of the project. Being a professional painter in Affton, MO over the last several years has allowed us to learn a few things. Below we have added a few tips that will give your home the million dollar look that you deserve to have. Check em’ out and if you are looking for a professional painter in Affton, MO then give us a call at (618) 560-7030. Fun Fact #1: Painting the wall behind your bookcases adds an elegant and sophisticated look to your home. We all want our homes to look like a million bucks, and one way we have found throughout the years is that by adding color to different places (ceilings, bookcases, stairs) it can give your home an elegant and sophisticated look that leaves your guest in awe. Fun Fact #2: Adding a thin crown mold above your baseboard and painting between gives an elegant look as it adds extra design and pattern to the bottom of your walls. Yup, as crazy as it sounds, it is true. Check out the photos below to see exactly what we are referring to. By adding extra texture to your baseboard gives an elegant and classy touch to your home. Fun Fact #3: Adding different color paint to your ceiling can make the difference between night and day. Having ceilings painted different colors gives your home a unique and sophisticated look. Rather you are going bold with a burgundy red or choosing a tan it will allow your room to pop. We always suggest that when painting your ceilings a color rather than white to make sure the ceiling and walls corresponds together. We often suggest that if you do a dark ceiling to keep the walls a light color. Below are the Most Common Painting Services for Affton Missouri. Most people paint their ceilings with white or an off white to give their ceilings a fresh coat of paint. Others like to add a splash of color rather it be a bold dark color to contrast the lighter walls or a lighter color to add character. One of our favorite ceiling images was that of a ceiling painted to match the front door behind it. It was so elegant and classy that we couldn’t help but share the photo (see above). Bookcases are a fun aspect of the home that can add texture and character. 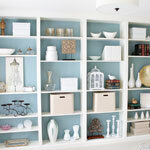 There are so many options of how you can paint and decorate your bookcase. You can either paint the bookcase itself or paint the wall space behind the bookcase or paint both. From a design perspective, we have fallen in love with the painting the wall behind the bookshelf a different color to give it a unique contrast that allows the bookshelf to pop. Baseboards are an elegant way to touch up the bottom of the wall. Rather you are looking to get your freshly installed baseboards painted or needing to touch up existing baseboards, we are more than happy to do the job for you. After all, why spend the day on your hands and knees painting when you could enjoy the beautify day and let us do all the hard work. Certified Painting Professionals offers many different services for businesses and homeowners. We are your Affton, MO professional painters. Give us a call today and we will be happy to stop by to give you a free estimate: (618) 560-7030.